My name is Jill Szalaj, and I am looking forward to answering your questions about yarn, knitting and crochet. I will also be sharing tips and techniques that I’ve learned through my own experiences, and hopefully inspiring you with ideas and projects to try. Please join in the conversation by sending me your comments and questions at jill@colornotesyarn.com or by using the Contact Us page. I would love to hear from you. Knitting charts are a way to describe a stitch pattern visually, rather than with words. If you are a visual learner, or think visually, try using charts instead of written instructions. Charted knitting designs are helpful for lace patterns, knit and purl textures, cables, intarsia, Fair Isle, and mosaic knitting. When working with a charted design, right side rows are read from right to left and wrong side rows are read from left to right. This is just as your knitting appears in front of you as you work. Many patterns include charts, but if the pattern you’re working with doesn’t include one, it’s easy to make your own. Knitting charts are simple to make using a spreadsheet, and the rest of this post will show you how. I work with spreadsheets a lot, and have found that they make excellent knitting charts. You can easily insert colors and symbols into each cell to represent a stitch, copy and paste groups of cells to repeat a pattern, and add colored borders to mark pattern repeats. A spreadsheet can be customized for a specific project, saved, and reprinted whenever needed. No more lost patterns. Another benefit to making your own charts is they can be customized to print out big enough to be read comfortably and to include only what you need. 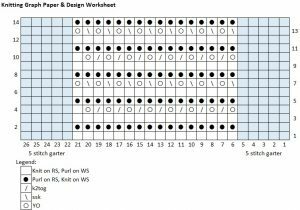 Try creating your own knitting chart using the sample file below. The file is in Excel 2013 format and is set up for 50 stitches by 50 rows, but can easily be made larger or smaller by adding or deleting columns and rows. The sample chart in the picture above is also included in the file. 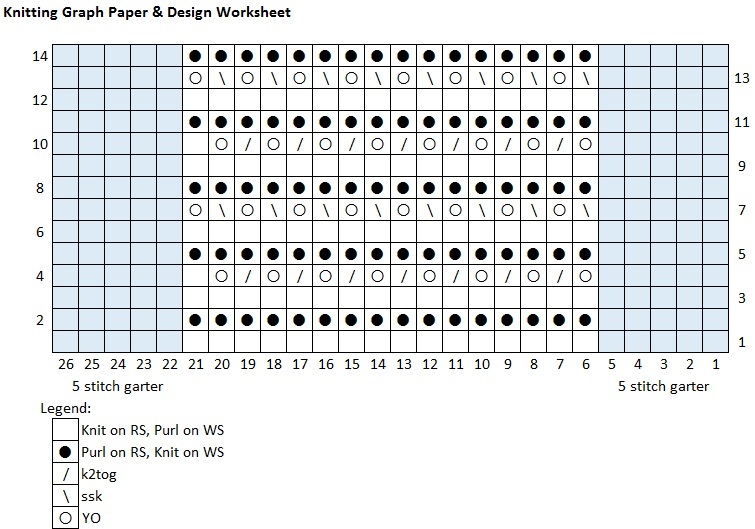 Download the sample file Knitting Graph Paper and Design Worksheet and save it on your computer. Add letters, symbols, and colors to the cells for each stitch as desired. See the Sample Chart in the file for ideas. Print your chart, and start knitting! Have fun with your charts. If you have any questions about using charts, or any other knitting or crochet topics, please send me a note through the Contact Us page, or email me at jill@colornotesyarn.com. Join our mailing list below for more information about yarn, knitting, and crochet. As a thank you, we’ll send you a coupon for 25% off your first order! Hi. Thanks for the template. I’m 100% new to Excel and knitting graphs (but I am familiar with Excel) Do you enter all the symbols using Excel or hand enter them? I’m working on some lace graphs that surely have odd symbols but I could enter them by hand. What do you do? Thanks again. how can this be converted to create crochet graph patterns? Just wanted to say a big thank you, I have been trying to find the ratios for a knitting spreadsheet for a while and here you are with a spreadsheet already to go! I can’t understand what the printing is on your web site. When I was printing the pages, some were overtyped and couldn’t read the charts. Maybe you can rectify the problem for the future. Thanks for your comments and apologies for my very late reply. We’ll look into the problem and try to resolve it. Thank you so much for this! I am an experienced knitter, developing a complex sweater pattern with mosaic patterns and just spent too long working on making just this graph base! You’ve made my life so much easier. Now I can spend my time and attention on the good, creative stuff! I am embarked on my fifth major mosaic project; I love doing them, each time employing different kinds of coloration as well as patterns. Thanks so much for the Excel download–very helpful! Thank you so much!! I’ve been wanting to tackle this for such a long time! I’d finally bought a book for excel that I didn’t understand, and was tempted to walk away yet again, but you’ve made it possible! I’m loving your knitting chart created in Excel and just courious where you found the knitting symbols within the excel program. Looking forward to hearing from you. Thanks for your feedback and apologies for my very late reply! The symbols in the charts are a combination of regular keystrokes from the keyboard (e.g., the slash symbols / and \ for ssk and k2tog) as well as symbols that are inserted in the cells using the “Insert” function in Excel. The symbols are taken from the “Symbols” font for the bullet symbol and the circle for the yarn over symbol. You can also insert symbols from different font sets as well, such as wingdings, or any other font that’s installed on your computer. Hope this helps! Thanks, Melodie. Glad it was helpful! Thanks for the feedback, and glad it was helpful! Thank you so much! I just couldn’t figure it out. What I really want to do is make a graph of my grandaughter’s name to knit. Thanks again! Just a thank you for making a template already set up and free for use! I was going to look it up and set my own up, but you saved me a fair amount of time and work! Thank you, Evelyn Glad it was helpful for you.